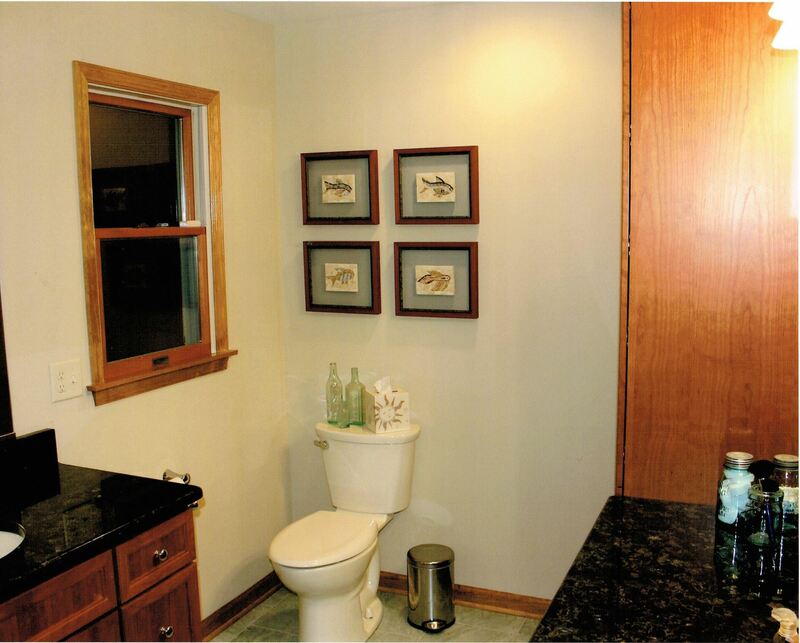 Renovating this track home bathroom, which was uncomfortably cold with limited storage space and insufficient light, into a warm, inviting space was accomplished by K + D Contractors for just $44, 075. The recently remodeled kitchen below the bathroom presented a few difficulties with reworking the plumbing for the new shower; the original vaulted ceiling over the tub contained a skylight, which also was removed. 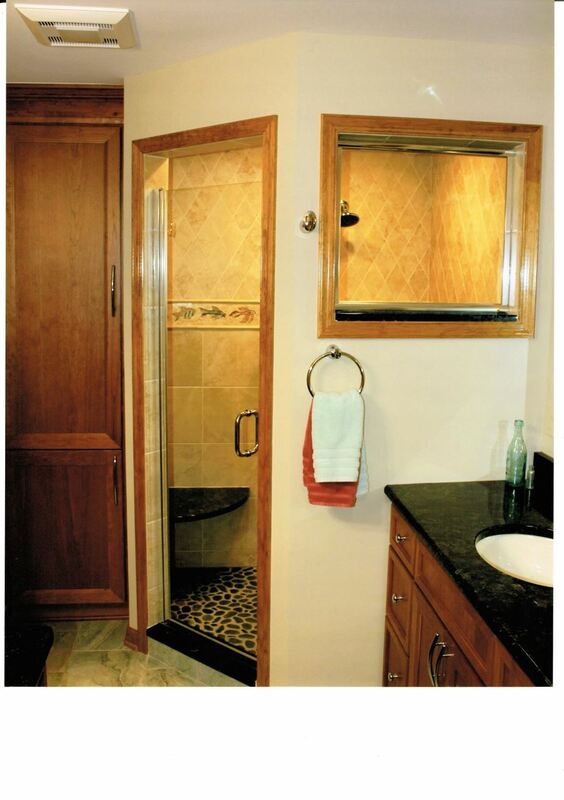 By relocating the shower, and making it the focal point of the bathroom, K + D Contractors created an inviting space. Adding R-38 into the newly framed ceiling, and an electric heat mat under the floor tiles enhanced the warmth of the room. A fixed glass window in the shower area provides light, along with two LED recessed lights in the shower add light. New vanity lights are now over the mirrors of the Vanity and Dressing areas. The shower floor was created out of river rock tiles. The bathroom floor tiles were set to follow the movement in the pattern of the porcelain tile. The additional tiles of the feature strip of tile in the shower were mounted into frames for an additional accent on the walls. 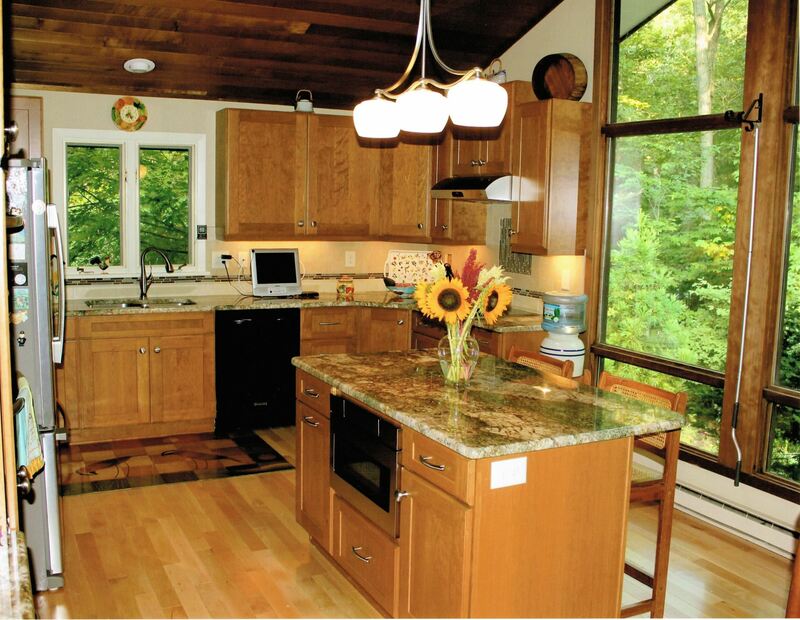 This homeowner discussed the problems of functionality and lighting in this older, dark kitchen, suggesting moving the window to provide more work space next to the refrigerator. K + D Contractors recommended moving the refrigerator, wall oven and cooktop to make the kitchen more functional! This is what won the contract. Relocating the refrigerator, wall oven, cook top and microwave opened up additional workspace for the homeowner. Rotating the island 90 degrees improved the work flow and houses the new microwave. The homeowner now has a new view of her yard through the existing large window wall. A finished basement required the contractor to install two electrical runs through a very narrow attic space, up and back down to the existing panels in the basement. Another glitch included getting a base cabinet through the existing kitchen doorway — removing one side of the doorjamb and casing permitted the cabinet to be slipped through the narrow opening. Lighting was increased by installing under-cabinet lights and pendant lights over the island. A new electric toe kick heater by the cooktop provided additional heat in the room. The prefinished micro-edge maple flooring assisted in keeping the project moving — cabinets could be installed as soon as the flooring set. With new countertops, stainless undermount sink, faucet and stainless knobs and pulls completed this kitchen for $74,359. This 1930’s home underwent a large addition and whole house renovation. KCH Contracting transformed a square stucco house into an eye catching, elegant home with materials that are both beautiful and maintenance free. Roof lines were accented with a ½ round musket brown gutter system. The new porch feature simply executed with coffered ceilings of bead board, which was duplicated throughout the home. A unique feature is the use of Hardie shingles were used instead of clapboard, which is how most homes in this area are designed. Azek trimmakes the exterior maintenance free. For $120,000, this homeowner has an exterior that balances the traditional with the clean look that is popular today; a modern home that is warm and welcoming; a house that fits in with as well as enhances the neighborhood.